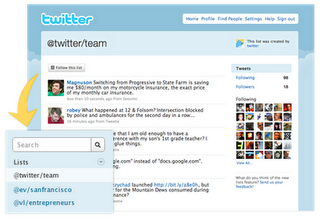 Have you ever wanted to aggregate Twitter profiles based on certain topics, genres, or interests? Well pretty soon, you’ll be able to! Twitter has just announced from their blog that they are working on the new Lists feature and testing it currently with a small subset of users. Another great featured of Lists is that the lists you create will be public – meaning other people can follow your list with one simple click! “The idea is to allow people to curate lists of Twitter accounts. For example, you could create a list of the funniest Twitter accounts of all time, athletes, local businesses, friends, or any compilation that makes sense. For right now, Twitter is testing out Lists with their small subset of users, but assures everyone through their blog that once it’s ready to go, Lists will be available for all Twitter users! Although we are 100% sure as to how Twitter plans on monitizing their business, a lot speculation is swirling around advertising running on Twitter. With Twitter Lists, advertisers could potentially get even more targeted exposure. Let’s say you created a list of your favorite college sports team – oh, say, the Georgia Bulldogs. The ads that displayed within the Twitter stream of that list would be very targeted – I would imagine.